(CNN) - At least two Republican presidential hopefuls are declining to participate in a debate moderated by real estate mogul Donald Trump. Texas Rep. Ron Paul and former Utah Gov. Jon Huntsman will both skip the debate, citing concerns about the seriousness of the event. In a campaign statement released Saturday, Paul's campaign called the debate a distraction from the real issues of the campaign. "The selection of a reality television personality to host a presidential debate that voters nationwide will be watching is beneath the office of the Presidency and flies in the face of that office's history and dignity," Jesse Benton, Ron Paul's national campaign chairman, said in a statement. He added, "Mr. Trump's participation as moderator will distract from questions and answers concerning important issues such as the national economy, crushing federal government debt, the role of the federal government, foreign policy, and the like. To be sure, Mr. Trump's participation will contribute to an unwanted circus-like atmosphere." Benton cited Trump's flirtation with running for president himself as a factor in the decision not to participate in the debate. "Mr. Trump's selection is also wildly inappropriate because of his record of toying with the serious decision of whether to compete for our nation's highest office, a decision he appeared to make frivolously," Benton said. Reacting to the Paul campaign's comments, Trump slammed Paul as a non-electable candidate. "As I said in the past and will reiterate again, Ron Paul has a zero chance of winning either the nomination or the Presidency," Trump said in a statement to CNN. "My poll numbers were substantially higher than any of his poll numbers, at any time, and when I decided not to run, due to the equal time provisions concerning my hit show The Apprentice, I was leading the Republican field." Trump announced in May he would not seek the nomination. In his statement, Trump said he was pleased to hear that Paul and Huntsman would be skipping the debate. 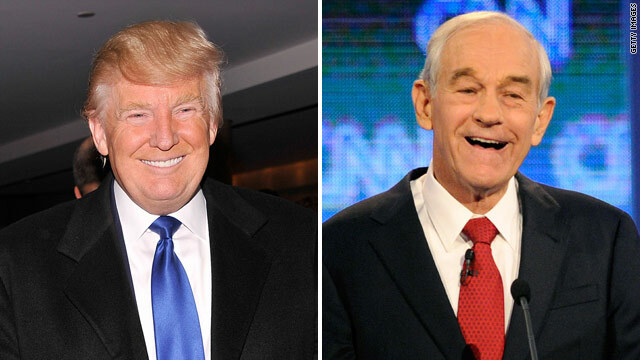 "Few people take Ron Paul seriously and many of his views and presentation make him a clown-like candidate," Trump said. "I am glad he and Jon Huntsman, who has inconsequential poll numbers or a chance of winning, will not be attending the debate and wasting the time of the viewers who are trying very hard to make a very important decision." Huntsman's campaign said Friday the former Utah governor wouldn't be making an appearance at the event. "We have declined to participate in the 'Presidential Apprentice' Debate with The Donald," Huntsman spokesman Tim Miller said in a statement. "The Republican Party deserves a serious discussion of the issues so voters can choose a leader they trust to defeat President Obama and turn our economy around." On Friday, the conservative online publication Newsmax announced they were sponsoring the Trump-moderated debate on December 27. It will be held in Des Moines, Iowa, just days before the state holds its first-in-the-nation caucus. Candidates for the 2012 GOP nomination have been meeting with Trump since this summer. Former Massachusetts Gov. Mitt Romney, Texas Gov. Rick Perry, businessman Herman Cain and Minnesota Rep. Michele Bachmann have all met with "The Apprentice" host at least once. On Thursday, former House Speaker Newt Gingrich said he would be meeting with Trump on Monday. Ron Paul is an intellectual beast. Donald Trump is the clown with more money than sanity.